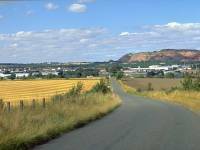 Today's 8-mile walk from Kirknewton to Winchburgh is a strange mix of rural, urban, suburban and industrial landscapes, of a type not seen since the latter stages of the Heart of England Way and of an extent unique to the whole End-to-End Walk. 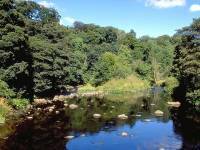 At one extreme is the beauty of the wooded riverside dell that runs through Almondell Country Park; at the other extreme are the spoil heaps north of Broxburn, relics of the extraction of parrafin shale during the industrial revolution. 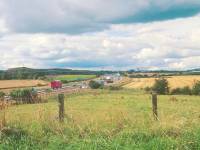 The rural landscape of West Lothian is not a beautiful one - while there are fields, hedges, trees and farmhouses, the topography is flat and the middle distance views are predominantly of townscapes, motorways and power lines. 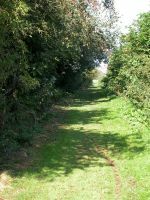 The route - conceived by Hamish Brown and also used in part by John Hillaby before him - keeps to what green corridors it can. 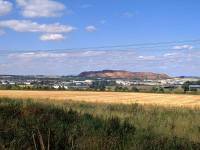 The town of Broxburn and the parrafin shale spoil heaps apart, it actually succeeds well in this task. 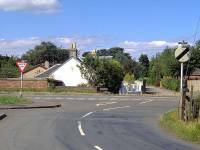 The walk begins where yesterday's finished, at the Ormiston Mains road junction a few hundred yards west of Kirknewton Station. 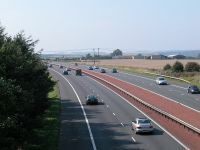 It takes the road towards East Calder, crossing a busy dual carriageway, but skirts East Calder itself to the east by means of a farm track. 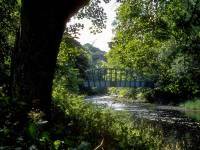 At the northeastern tip of the town, the route enters Almondell Country park, using its driveway as ar as the first riverbridge and then utilising the delightful network of riverside paths to the main bridge. 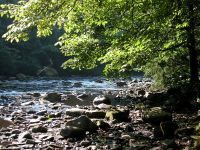 We cross to the north side and continue to the visitor centre, then use the modern suspension footbridge to cross to the Shiel Mill path. 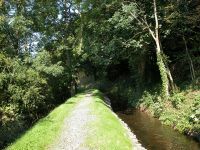 Past the mill, a path (signposted "Lins Mill"), runs alongside a stream, actually a feeder channel for the Union Canal a mile ahead. 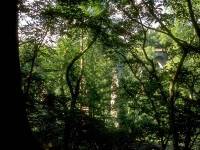 The path is mostly wooded and can sometimes be a bit sketchy. 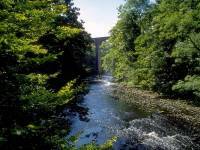 It swings northeast, along the Almond valley, giving views of the magnificent canal viaduct ahead. 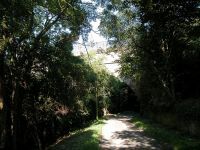 The route climbs a flight of steps to the adjacent road and then drops again - be sure to pass under the arches of the viaduct as you need to take the north side towpath of the canal. 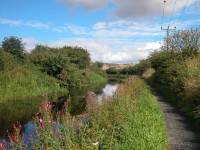 The Union Canal was built to link Edinburgh to Falkirk and maintains a level course throughout, with no locks. 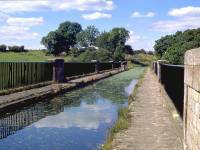 Sadly, parts of the canal have been culverted and it is thefore unnavigable by pleasure craft. 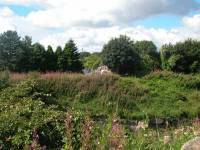 Plans are afoot to rectify this situation and in a few years it may be open to narrowboats once more. 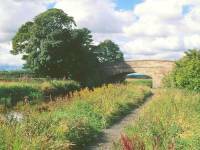 Our route follows the towpath for nearly a mile, but we leave it to head north along an unclassified motor road, swinging high above the M8 on a gracefully arched bridge, to reach the east end of Broxburn between pleasant suburban houses and a new industrial estate. 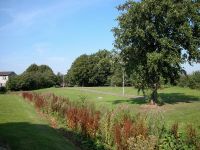 The roue follows the road towards the town centre, but a variation can be made by doglegging north via a recreation ground and park. 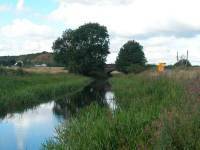 The aim is to follow the northbound road to the next loop of canal. 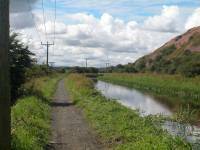 This is a section with no scenic merit whatsoever - the shale heaps tower across the opposite side and it's a relief to leave the canal a mile further on for the track to the curiosity that is Niddry Castle. 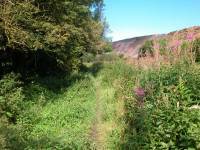 You pass between a golf course and a second wasteland of shale to gain the path climbing up over the rail tunnel portal just south of Winchburgh, and enter the town via a couple of suburban back lanes. 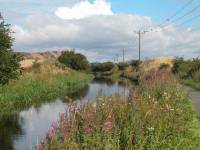 The Stirling-Edinburgh bus service can now whisk you back to your lodgings, or if you've made good time and still feel fresh you could press on to Linlithgow, six miles further along the canal towpath. Begin at the road junction where you ended the walk yesterday. The Pentlands are, strangely, not in view; neither is the city of Edinburgh, twelve miles to the east. 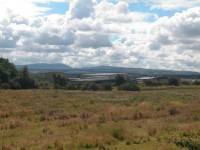 There are distant views to the Ochils, but the predominant scene is one of fields, townscapes and power lines. 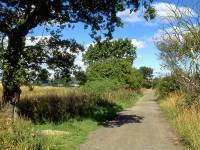 Walk westwards along the road to East Calder. 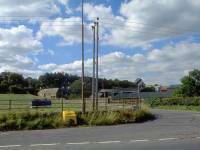 In about 500 yards you arrive at the busy A71, which you have to cross. 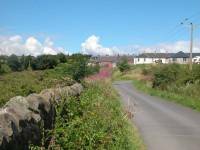 Take the access road to East Calder. 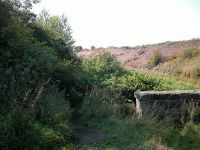 About 300 yards beyond the crossing, a rough track appears on the right. 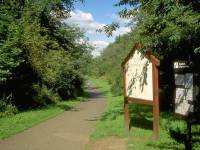 It's signed, "Public path, East Calder". 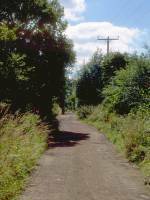 The track is about 1km long and serves to bypass East Calder to the east. 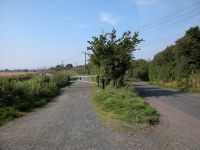 The track comes out onto the B7015 road at the eastern end of the old part of East Calder. 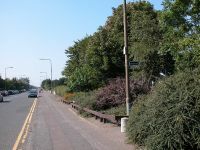 Turn right (east) towards Edinburgh, crossing a bridge over a defunct railway. 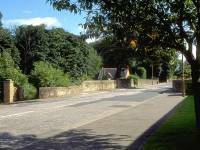 In only 200 yards the driveway of Almondell Country park leaves the road to your left. Enter through the car park beyond rather than by the gatehouse, which is a private cottage, and double back beyond it to the driveway again. 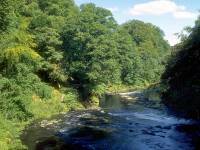 The River Almond, which passes between East Calder and Livingston on its way to the Firth of Forth, runs through a delightful wooded dell just north of here, which nowadays forms Almondell Country Park. 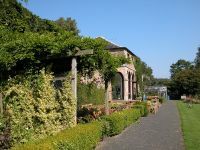 It was once the home of a branch of the Erskine family, who were the Earls of Buchan. 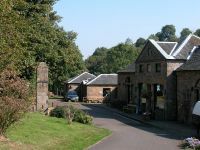 Almondell house itself no longer stands but one of its former outhouses now serves as the visitor centre. 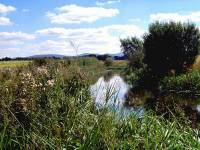 The visitor centre serves refreshments and also has aquatic and biological exhibits. Lawns nearby are strewn with picnic tables. 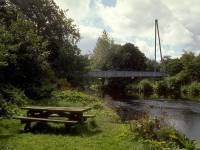 The river Almond is the centrepiece of the park, however, and its picturesque riverside walks and its interesting collection of bridges invite you to linger. Walk up the driveway from East Calder. 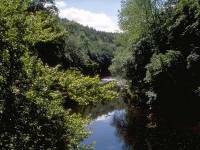 The river comes in from the left. 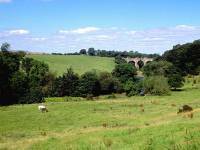 It's worth exploring the path network hereabouts, because it leads up to a disused raiway viaduct over the river which is a superb viewpoint. 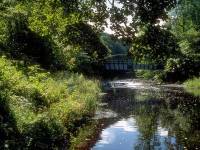 A bridge just downstream from the viaduct is unusual in that it carries a feeder stream from the Almond to the Union Canal, two miles downstream. It also doubles as a footbridge. 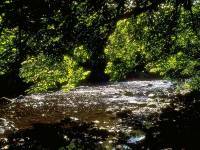 You can follow either bank of the Almond here - my advice is to follow the right (southeast) bank for preference. 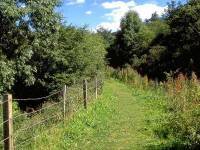 The path now loops away from the river slightly and comes out in an area of open parkland. The grass is relatively rough and poorly drained for a couple of hundred yards. 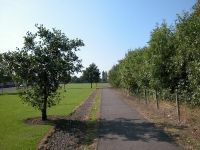 The path continues towards a patch of finer turf, decorated with picnic tables and stands of trees, as it approaches the main vehicle bridge. 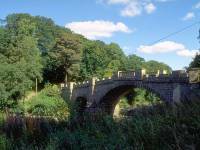 Our route now crosses the vehicle bridge, designed by Naismith (better known as a painter). 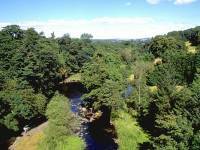 Views of the river from the bridge can only be described as superb. 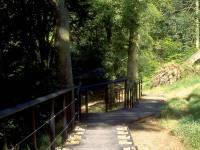 Beyond the bridge, drop off the driveway to your right and follow the riverside path once more to approach the visitor centre. 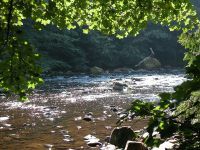 The picnic area; Naismith's bridge; downstream view from the bridge. 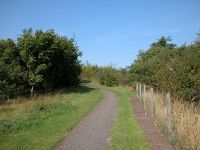 The path passes the fenced-off garden of the visitor centre to the south. You need to walk pretty nearly all the way round it to find the entrance. Its opening hours are a little skeletal (it closes for lunch, for instance, and opens only on certain days of the week). 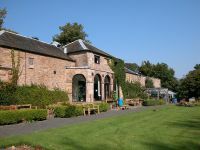 A toilet block can be found across the lawns to the east, beyond which there is another cluster of picnic tables. The lawns are popular as a childrens' playground. Beyond the lawn is another footbridge, the graceful and imaginative single-mast suspension bridge dedicated to Nelson Mandela in 1986. 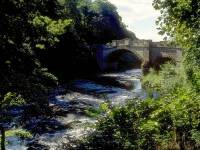 Cross this bridge, leaving the grounds of Almondell Park, and follow the path downstream on the right bank. 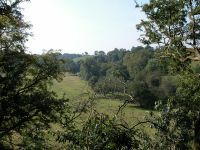 Upstream view from the bridge; downstream view. 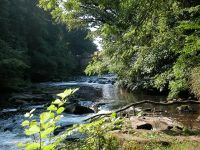 The path loops away from the main river now, running alongside the canal feeder stream A short distance after leaving Almondell it comes out onto the public road to Shiel Mill, from where a path signposted "Lins Mill" bypasses a cluster of buildings on the right. 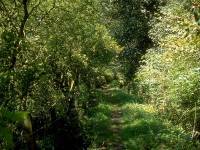 The path comes close to the river again for a short distance and then leaves it to the right, following a raised bank through denser woodland with the canal feeder stream to the right. The first time I walked this path in 1994 the route was very sketchy, but in 1999 it was very easy to follow. 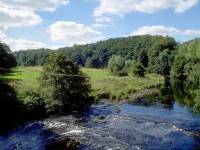 The view eventually opens up to your left as you reach a series of riverside pastures grazed by cattle. You are now within the municipal boundaries of the City of Edinburgh. Doesn't look like a capital city here, does it? The City of Edinburgh section of the walk is brief. Unfortunately, it's also slightly tricky. 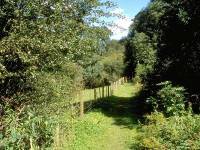 The rule is to keep within the ribbon of woodland, ignoring promising looking paths tracking leftwards across the pasture. 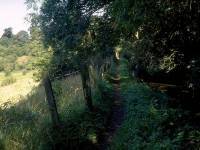 At a point where you reach a fence and stile, cross it and stay on the right side of the fence. 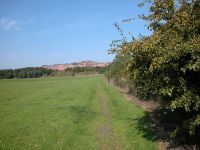 The path curves gradually round to the north. The feeder stream has disappeared into a culvert nearby. 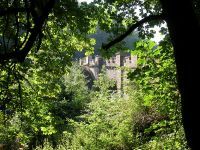 To your left you will catch glimpses of Lins Mill Viaduct, which carries the Union Canal over the river Almond up ahead. 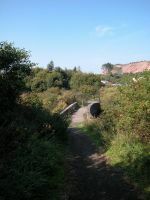 As you near the viaduct the path disappears up a steep flight of steps to the right, coming out onto a minor motor road. 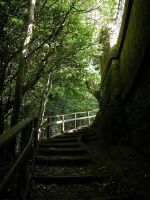 Follow the road under the viaduct, then turn immediately right to climb a flight of stone steps up to the canal towpath. 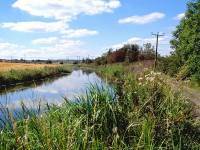 Welcome to the Union Canal. 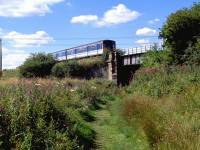 Our path now crosses the viaduct on the north side, leaving the City of Edinburgh and re-entering West Lothian. 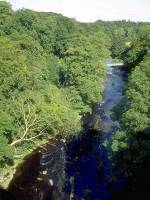 The view back along the Almond Valley is most impressive, the view downstream to Linn's Mill itself less so.The viaduct iitself is also a most impressive structure. 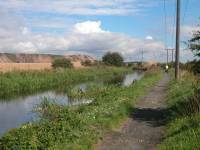 We have roughly about a kilometre of towpath walking ahead of us before turning off to Broxburn. 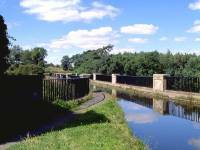 The canal was built by Thomas Baird in 1822 to link Edinburgh to the older Forth-Clyde canal at Falkirk. 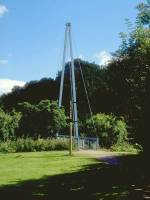 Throughout almost the whole of its 31½ mile length it stays on the 240ft contour and the only locks along its length are at the Falkirk end, where it dropped to reach the Forth-Clyde canal at the Union basin. 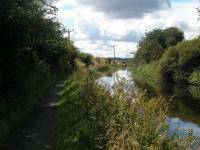 Sadly, the canal fell into complete disuse in the second half of the twentieth century, navigation being impossible due to culverting by modern roads, notably that of the M8 not far ahead. 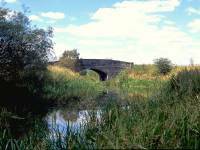 However, plans are currently in progress to re-engineer the offending bridges and culverts to make navigation a possibility again. 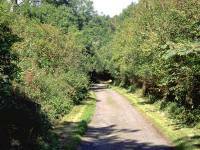 Our route follows around a number of curves, coming very close to the Edinburgh - Bathgate railway line at one point. Shortly afterwards it reaches a bridge (no. 20) carrying a minor road to Muirend. You will probably find cars parked here. 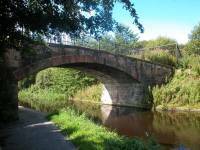 Leave the canal at this point and take the road northwards, under the railway bridge. Four hundred yards further on the road crosses the M8 by an overbridge. 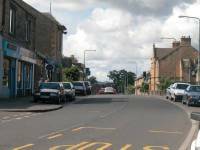 The road runs through the tiny locality of Burnside before reaching the eastern end of the town of Broxburn. 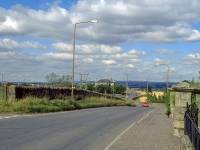 You must first cross the busy A89 Broxburn bypass and then walk along the short residential street of Newhouses Road to reach the A899 main road through the town, opposite the Thstle industrial estate. A bus stop almost opposite allows a speedy return to Edinburgh for those who wish to break the journey here. Turn left, initially following East Main St towards the town centre. 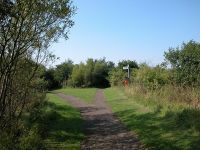 Hamish Brown's guidebook to the walk directs you along a track northwards from Newhouses Road to gain the towpath of the canal once again, but since he published his book this track has been erased by the development of the industrial estate. 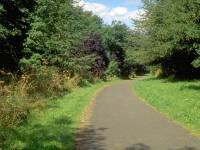 In recent years it's been necessary to walk into the centre of Broxburn to regain the canal towpath, but now a new route has been provided that bypases the town centre and reaches the canal via Buchan Park. 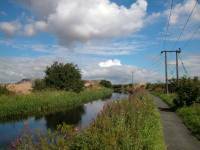 A short wat along East Main Street look out for a fingerpost across the road saying "Union Canal". 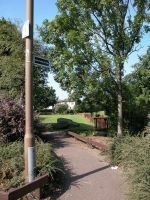 The footpath enters a little park. 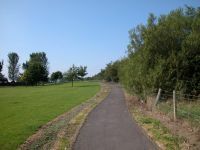 Follow the path seen across the ditch in the third image above for a short distance, then go to your right to find a grassy track between hedges that runs alongside the Thistle industrial estate (pictured below). 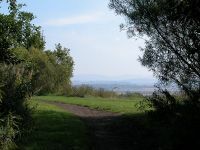 At the far end of this path you come out into Buchan Park. 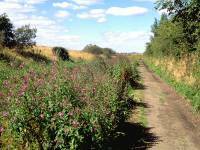 Follow a made track along the eastern edge of the park. Initially this heads north directly towards the canal, but it gradually curves around to the left (west). 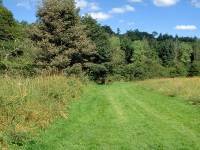 At the end of the more formal area of the park there's an area of rougher pasture, tending uphill to the right. 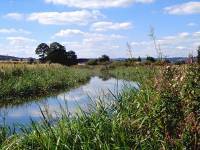 This is an earth bank, beyond which is the canal. Stay as far to the right as possible, sticking alongside the boundary fence. You'll soon reach a gravel path again. Follow this as it gradually climbs the earth bank. 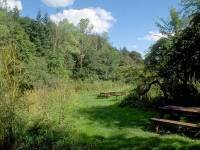 This area is dotted with trees and shrubs. 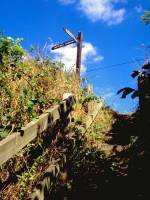 Avoid any shortcuts you see to the right as these will lead you into difficulties. 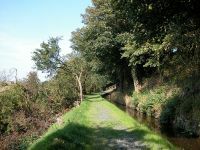 At the highest point of the path turn right into a gap between the trees, where you'll see a stone bridge crossing the canal. 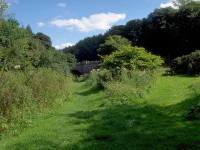 Don't cross the bridge but go to the left to find a steep, narrow and slippery path dropping diagonally down the bank to reach the canal towpath. 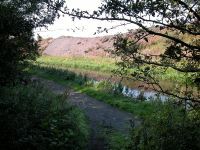 On the other side of the canal, is a massive spoil heap of red shale, the remnant of a once-thriving parrafin extraction industry. 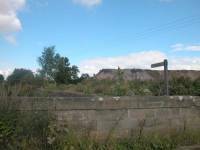 James Young's parrafin works were responsible for the very existance of Broxburn so I suppose we shouldn't be resentful of the spoil heaps, but it would surely be an improvement if the local authority could find some way of softening their visual impact. Turn right, under the bridge, and resume the walk along the canal towpath. 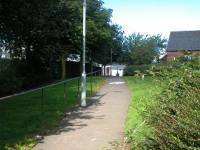 Keep an eye out for cyclists - this is a favoured cycle path and there is not really enough width for cyclists and pedestrians, so be prepared to give way every couple of minutes. 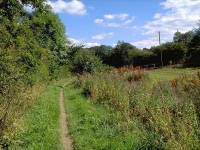 The towpath is accompanied by a line of power cables, which doesn't exactly do anything to improve the scenic beauty of this stretch. 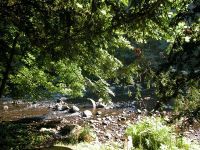 However, choose an nice, sunny day in July or August when the vegetation is at its best and even this area can look quite handsome. 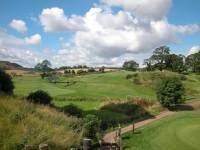 The views towards the Pentlands are inviting, and if you look more or less due east you will see the characteristic "crouching lion" shape of Arthur's Seat, a craggy hill approaching 800ft high that lays immediately east of Edinburgh's city centre. 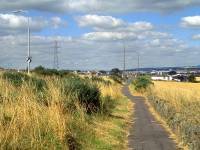 As it approaches Niddry the canal curves around to the left (north). 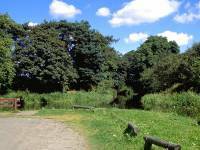 Once again we enter the boundaries of the City of Edinburgh, the city limit here following the centre of the canal. 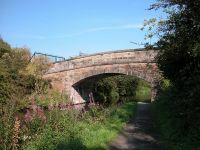 Look out for bridge 29, shortly before which you leave the canal towpath to cross a narrow neck of grass verge to the road immediately to your right (second image above). Turn right along the road, which in a very short distance crosses the main Edinburgh - Glasgow Queen Street railway line. 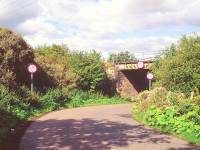 Immediately beyond the railway bridge turn left again, re-entering West Lothian from Edinburgh for the final time, and take the track towards Niddry castle, signposted as a footpath to Winchburgh. 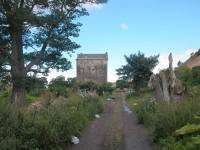 Niddry Castle is a gaunt, unlovely block of a thing, a style of fortified house not untypical of Scotland. 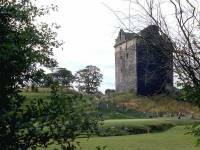 The Scots tended not to go in for turrets, spires and crennelations. The purpose of their castles was not to impress or intimidate - they were secure refuges and their builders felt no desire for decoration. 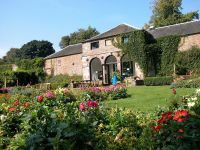 Dating from 1490, it enjoyed brief fame as a refuge of Mary Queen of Scots before falling into neglect in the seventeenth century. 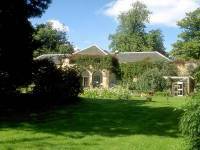 In recent times it has been restored, and is now a private residence (don't expect to be admitted). 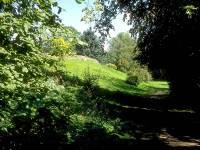 Stay on the path past Niddry Castle, which you keep to your left. 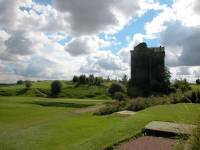 Immediately beyond the castle you reach a golf course. 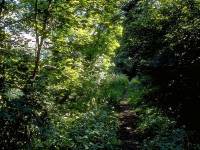 Make your way diagonally to the right and go through a gate then turn half left to follow an unkempt path, which has an area of scrubby woodland (backed by a second spoil heap) to your right. 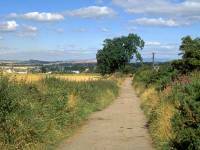 Walk onwards into the village of Winchburgh. 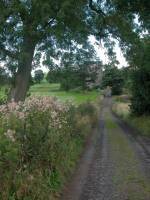 The track from the golf course enters Winchburgh by Castle Road, a pleasant residential backstreet. 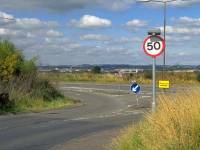 You might choose to take a left along Castle Terrace or Oakbank Place before emerging onto the main B9080 road into the village centre. 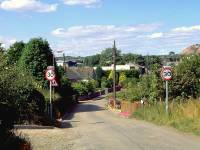 There isn't much to Winchburgh. 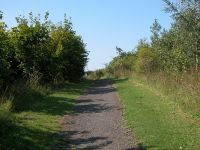 A hundred yards or so west of the road junction that marks the village centre is a flight of steps that leads back to the canal towpath and the walk onwards to Linlithgow. 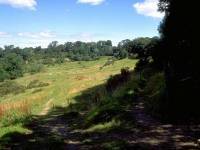 It's six miles to Linlithgow, and if you've arrived at Winchburgh in good time and feel like carrying on, the combined 14-mile walk is within the capabilities of most hikers. 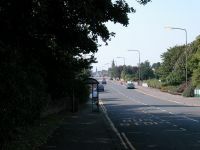 Otherwise, a bus stance on the north side of the B9080 is a stopping point for the main Stirling to Edinburgh bus route, which will have you back in the capital in little over half an hour.